After the fair is before the fair! We look back on a great and successful event 2017 – and now that it’s over, the kick-off for the preparations of the new edition took place. 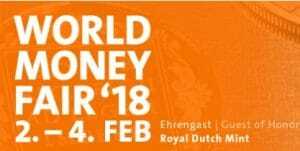 We will be happy to welcome you again at the 47th World Money Fair, from February 2nd to February 4th, 2018. Let’s look forward together to another edition of the world’s largest coin fair.